Our easy 3 Ingredient Peanut Butter Cookie is hands down THE Best Peanut Cookie I have ever had. It’s an old fashioned recipe that requires just peanut butter, sugar, and egg. 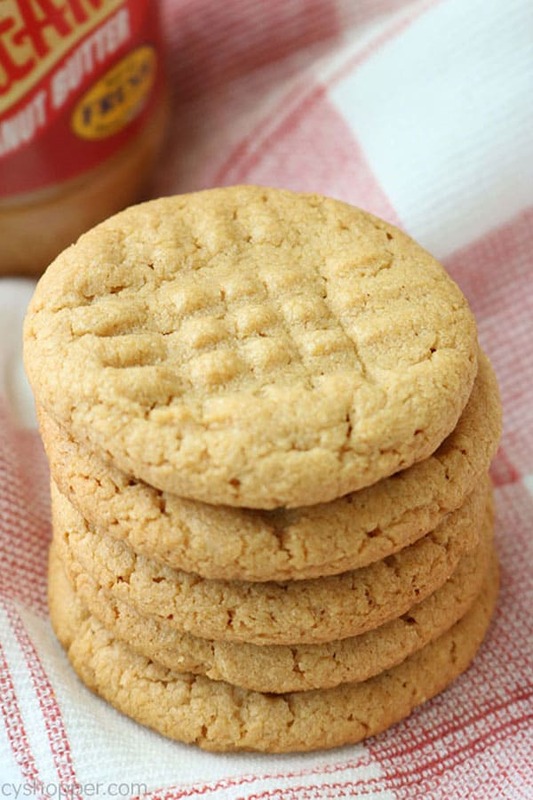 You will find them soft, chewy, and so much easier than a traditional peanut butter cookie. 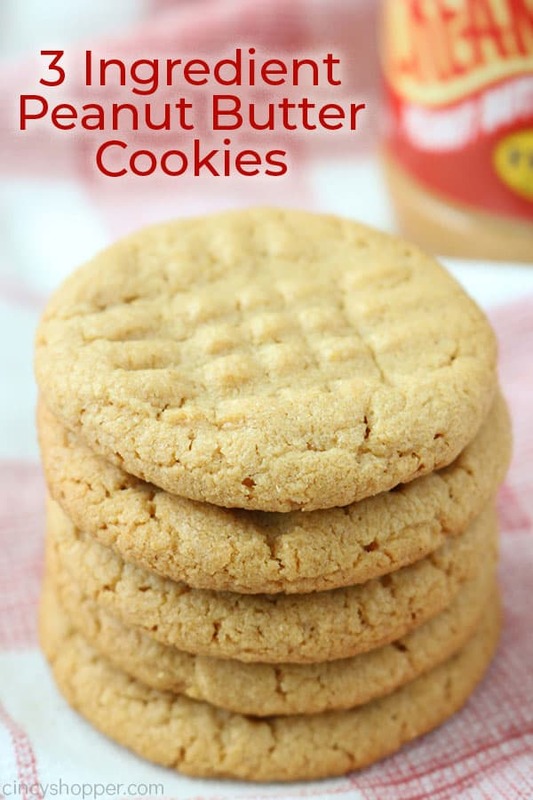 Years ago, when I first started sharing recipes here on my blog, one of the very first recipes I made was this very 3 Ingredient Peanut Butter Cookie recipe. Today, I am sharing some new images for all of you as the ones I shared with you before were not the best and this Peanut Butter Cookie is one of my favorite recipes that I have ever shared. I remember the first time I made this easy cookie recipe. I was seriously so skeptical. I am very thankful that I did not rush to rule out making them. I have made this same peanut butter cookie recipe so many times, I would never be able to count. We have made batches to have for all the kids school lunches, for potluck dessert, and even for my aunt’s office party. And of course they make for the best Christmas cookie too! I am a HUGE fan of peanut butter everything. If you have followed my blog at all, you probably figured that out. 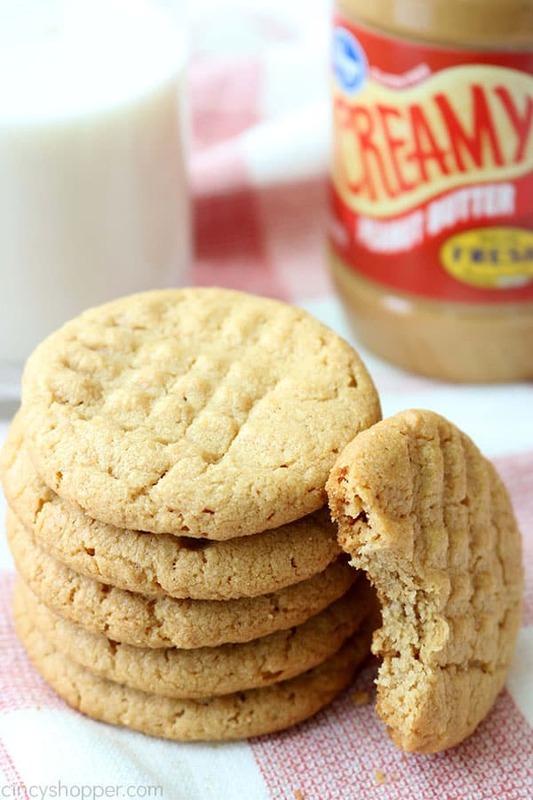 When asked “what is your favorite peanut butter dessert ?”, I always have to choose between this 3 Ingredient Peanut Butter Cookie recipe and my Peanut Butter Blossom Cookie. 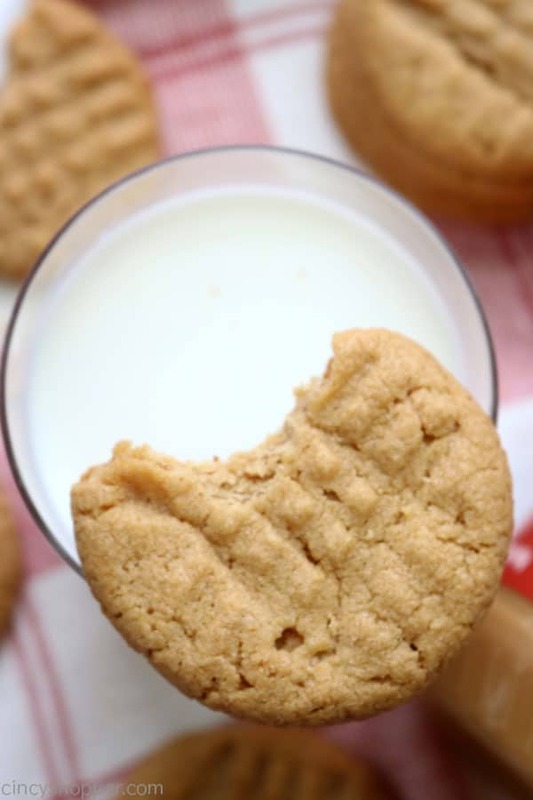 My choice is always this peanut butter cookie recipe. The reason I guess would be is that the recipe is so simple, they can be made in little time, with little mess, and the results are so amazing. After some research, this cookie recipe has been around for quite some time. They say they are old fashioned, you may have enjoyed it in the past but you may have not realized that the recipe was so simple. I love classic cookie recipes and I guess this one is a member of that group. 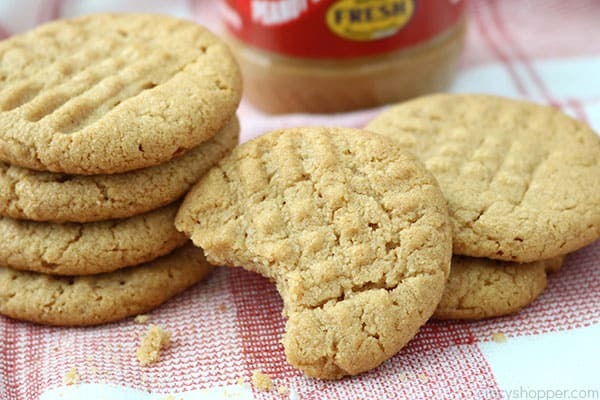 If a soft peanut butter cookie is your favorite, this really is the recipe for you. 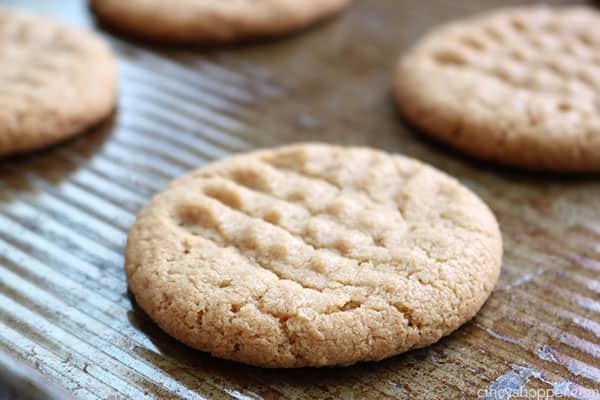 If you like a chewy peanut butter cookie, this recipe is for you too. The cookie is really perfect for just about anyone who likes peanut butter cookies. Go ahead and make this recipe for 3 Ingredient Peanut Butter Cookies. 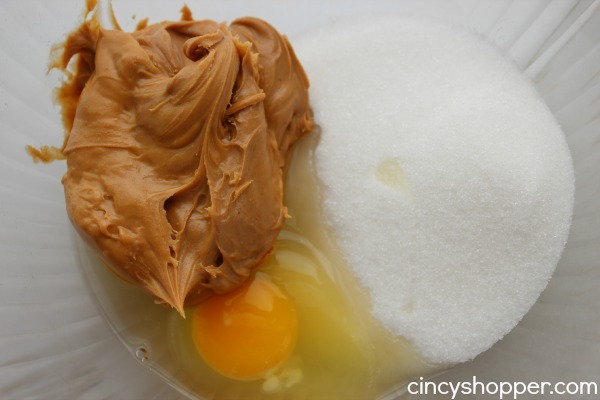 Just grab your Peanut Butter, Sugar, and an egg. 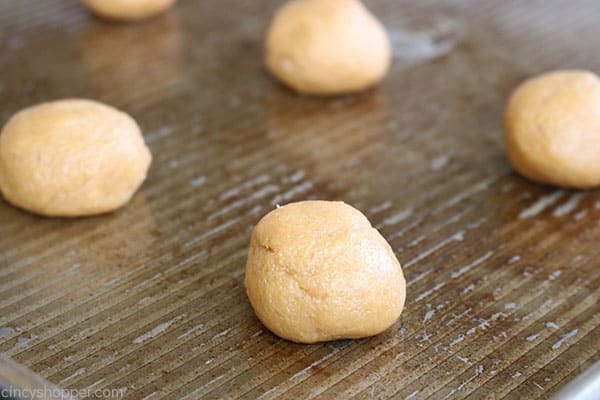 You can have your cookies baking in the oven in no time at all. Stir the ingredients together until well blended. Roll into 1″ ball, place on ungreased cookie sheet. Using a fork press down in one direction and then press again from the other side to form a criss cross pattern on top. Allow them cool on the cookie sheet for a couple of minutes before transferring to a wire rack to cool completely. 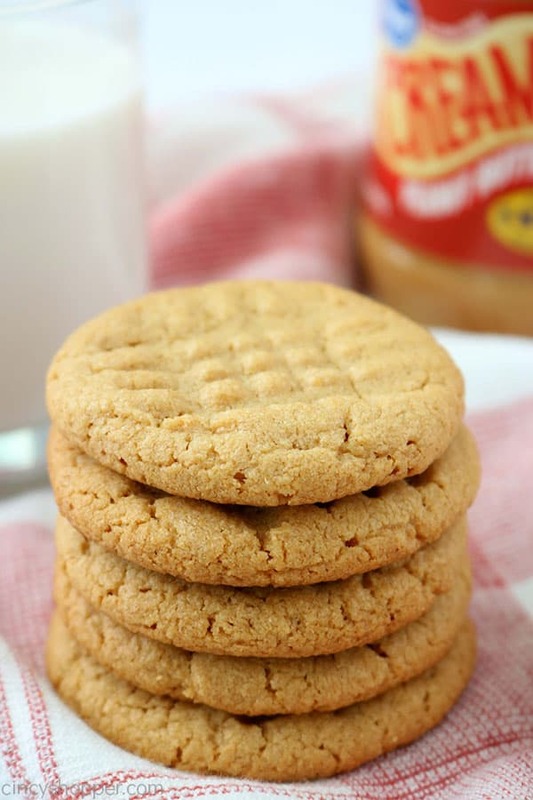 What Peanut Butter works best for this 3 Ingredient Peanut Butter Cookie Recipe? Grab that cheap store branded smooth peanut butter to make these the BEST 3 Ingredient Peanut Butter Cookies. I have never used a chunky peanut butter. If you try it, be sure to leave us a comment as to how it worked for you. I have used a natural peanut butter because that is normally what I have on hand in my pantry. 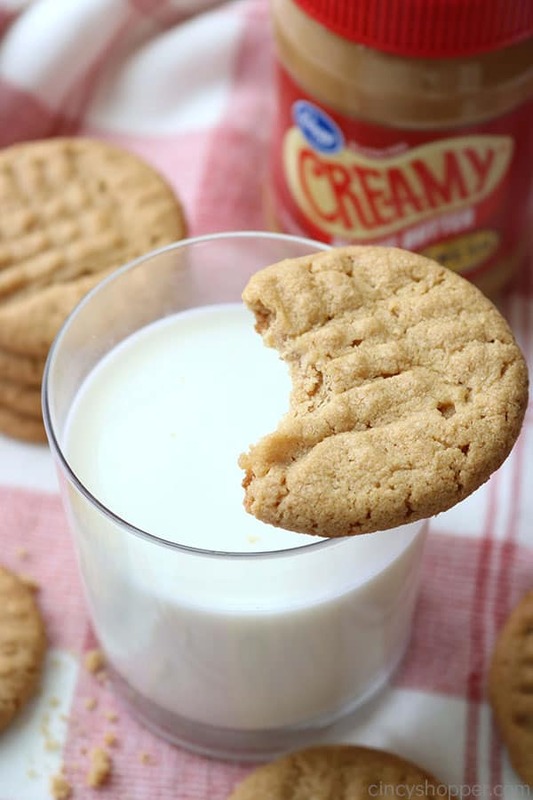 The natural peanut butter works but the cookie has a bit more of a crumbly texture. A Jif or a Skippy Peanut Butter works too. The Best peanut butter that I have used for these cookies was the store brand. I believe the oil in the generic makes the cookie so much better. Can I add add some mix-ins to the 3 Ingredient Peanut Butter Cookies? Sure go ahead and add in your chocolate chips, peanut butter chips, nuts, m&m’s or maybe even some Reese’s Pieces. We have added mix-ins as well as vanilla to our recipe in the past. 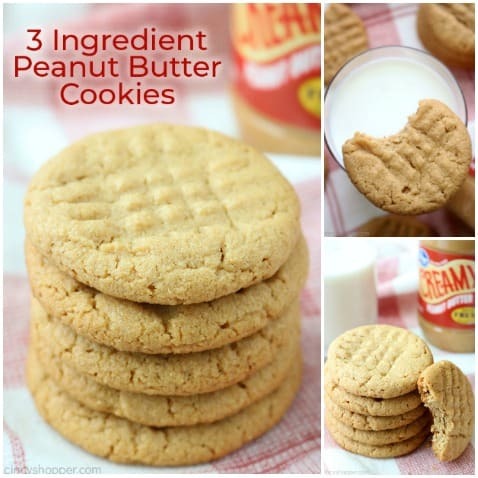 Can I make this 3 Ingredient Peanut Butter Cookie with brown sugar? I have seen many recipes around on the web that use brown sugar instead of the plain white sugar. I have never tried that recipe. 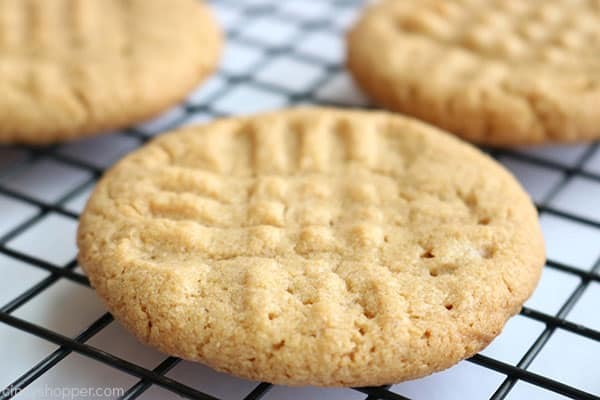 I feel that this recipe really is spot on and makes the best peanut butter cookie. If you make my recipe, be sure to drop a comment below, share, and tag my blog on Facebook or Instagram. Roll into 1" ball, place on ungreased cookie sheet. I’m definitely trying this now! I am bored today (stuck inside because of this crazy weather!) and need something fun to do plus this will go great with coffee like you said!! Thanks for sharing!! Hi Kim! The weather is making us all bored, lol. How did yours turn out? I thought they were GREAT for being so simple. They were awesome!! Thanks for sharing this recipe! They were a hit with the family — so easy to whip up and they taste great! Stay warm! I’ll definitely make these again! Hi Diep! They are! A yummy soft cookie. Give them a try. If you are a fan of peanut butter cookies you will love how simple, quick, easy and tasty these cookies are. I just made these cookies. I am totally not impressed. I do not like them. Just way too much peanut butter. They are dry also. Hi Misty. I am sorry you did not care for them. We have made them quite a few times and really like them. Quite a few of my extended family have tried them too and raved about them. So sorry they were not the recipe for you. It is a great recipe but I have found out that you have to have the right peanut butter to use for the smoothness or it does come out crumble. 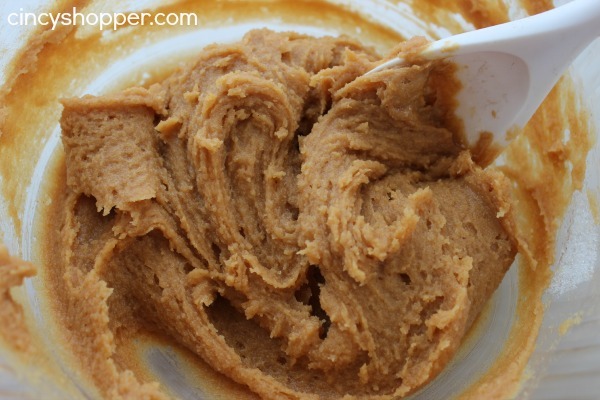 The peanut butter needs to be smooth and creamy with the oils in it. Any other it does not work well. Once you find the right peanut butter to use keep with it, it will work out for this recipe. I use Skippy, they turn out wonderful and yummy! I ran across this post when I was in a pinch for a play date snack. All the kids and the parents loved them. Including my really picky husband. I prefer using the Reeses peanut butter over other brands when making this cookie though. This is the recipe my brother has always used. It is perfect, simple, and easy to adapt if desired. I made 2 batches, one with brown sugar and one with white, both equally good. We turned a 1/4 of the dough into thumb print cookies, with raspberry jelly in the center, a 1/4 we pushed a few chocolate chips into the middle, 1/4 we added vanilla, rolled them in granulated sugar and sprinkled with salt, and a 1/4 were left plain. and sometimes oatmeal or choc chips or a kiss in the middle. Gluten free and so so easy. Instead of using a fork to make the criss-cross on p-butter cookies I use a potato masher. Makes a nice 1-step design. Learned this from my Amish neighbors. I’ve been making this type of cookie (with added vanilla) ever since I gold my old Ronco cookie press (it was one of the recipes that came with the gadget). This recipe is broken down into a super-convenient formula though; thanks! Those cookies were always a huge hit. Besides adding a little vanilla, I sometimes have added a little flour (like, a couple of tablespoons). I do this if I’m using a cookie press, since it helps to keep the shapes defined. The flour adds a slightly different texture which is equally appealing; almost an unimaginably thin little crispy crust. I made these as my first attempt at peanut butter cookies and they are so good!!! Toddler approved too. :) Much better than any other peanut butter cookies I’ve ever had. Yum. I think next time I may add some sort of chocolate element. Thanks for the new lifetime recipe! This is bloody unbelievable! The texture is so cookie-ish if I hadnt made them myself I would have been sceptical of these lacking any flour! I made it from home made peanutbutter, used brown sugar and much less of it (10 g) and my bach gave me 23 cookies . And I am pretty pleased at what NutritionData has to say about it also! Thank you for this awesome recipe! I have to get more peanuts to roast and cookiefy for my kennel training day on Sunday! Would this work using erythritol or another type of sweetener instead of sugar? I have been making these for years using Splenda to avoid calories and carbs from flour. I use Kraft chunky peanut butter and also the vanilla. Let guilt in this treat with tea. Some unexpected company sent me on a search for a quick peanut butter cookie recipe. This recipe came together in less than five minutes. I used a small cookie scoop to make 16 cookies. These cookies are soft and delicious. Everyone loved them. Thanks for posting. I will be pinning this one for sure. Was I skeptical about this recipe? Absolutely, in every since of the word. Was I surprised by the outcome? Pleasantly. These are amazing. And they are really easy! Love these cookies. So easy and quick to make. I didn’t believe first when I saw the recipe.i was like a cookie without flour? I would recommend to my friends for sure who are in to baking….thnx again! Being a lover of peanut butter I made these after seeing Paula Deen make them. I use Skippy Natural (fewer ingredients) Super Chunk. These are amazing! Making these now, but with almond butter! I’m allergic to peanut butter, but I’ve always been curious about these cookies! If these come out, I’ll ask my daughter if she wants to make the peanut butter version(she’s allergic to almonds!) ……I can’t help her though……that pesky hive and anaphalactic shock thing….. These cookies were fantastic! They were a hit with the husband, six year old, and 21month old. Followed recipe exact, no variations; used Skippy Smooth Peanut Butter. Cant wait to try with mixins. . .Reeses’s Pieces, chocolate chips, toffee nut chips, etc! Thank you for sharing! Me and my 7 year old son are addicted to peanut butter plus I nurse my 11 month daughter with a new baby due in 6 more months… This recipe hits my cravings and is one of the quickest desserts I’ve come across. Thanks again! I just remembered the follow up question: The sugar is white granulated sugar, yes? Love them, huge hit with the kids and hubby!I did 1c Peter Pan Honey Roasted Chunky PB, Ic Sugar, 1 egg, 1/2 tsp vanilla, and 1/4 tsp salt the second time, omg sinful!! Thank you for an easy, delicious recipe!! These are so yummy and easy (and easy on the budget). My peanut butter was very oily so I added about half a cup of ground flax and the result was perfect! I made these a few weeks ago and they were TOO SWEET for my taste, but I made them again today using half the sugar and they are perfect! I’ve never made these with smooth- always chunky and they come out delicious! So glad that you enjoyed them as much as we do:) If every recipe were this easy and delish, we would have it made. I made these tonight. It’s amazing how fast you can bake delicious cookies with the this recipe! 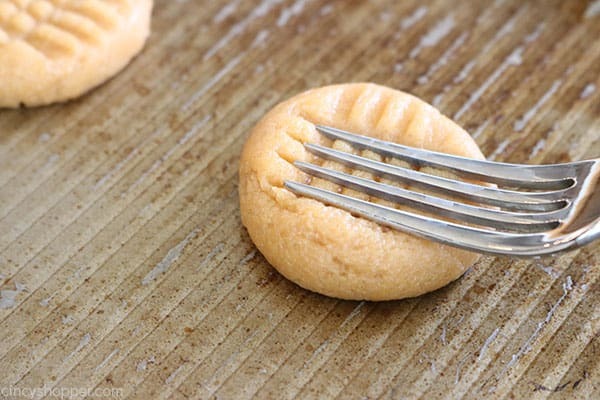 I made them with chuncky peanut butter and it works great and gives an extra bite to it. Thank you so much for sharing this recipe :) My husband loved them too! Can’t wait to try these!! I have a batch in the oven now!